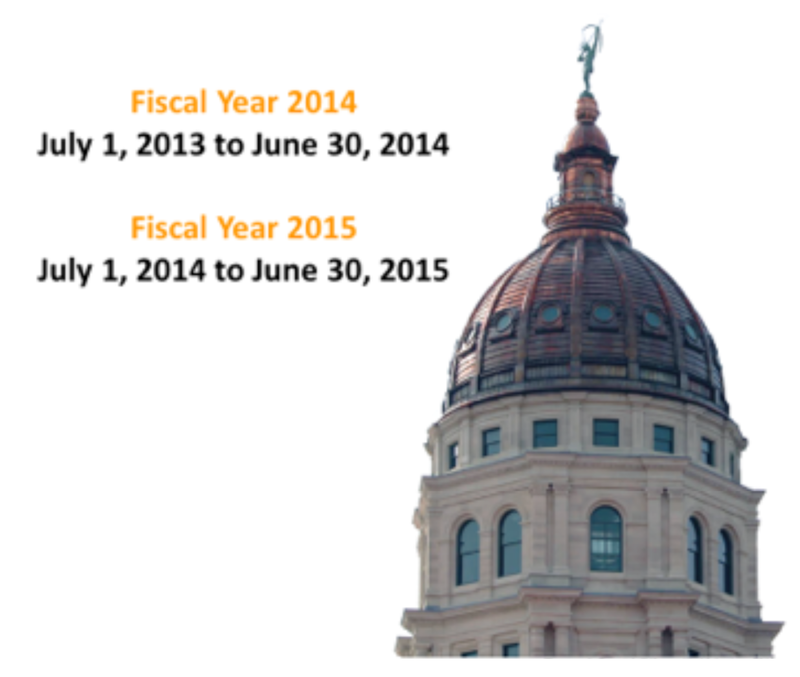 The state budget that lawmakers have put in place for the fiscal year beginning July 1 is badly out of balance, making mid-year budget cuts the first order of business when the Kansas Legislature returns to session in January. But as hard as it may be to make those cuts, an even bigger problem awaits—putting together a new budget for FY 2016. FY 2014 (July 1, 2013 to June 30, 2014). Revenue collections fell very sharply in FY 2014 as a result of dramatic tax policy changes in 2012. When all of the numbers are finally tallied, spending will have exceeded receipts by about $350 million, cutting the state’s bank account in half. FY 2015 (July 1, 2014 to June 30, 2015). Lawmakers approved a budget for FY 2015 with spending set $322 million higher than the official revenue estimate, which essentially wipes out the rest of the bank account. But that’s the best case scenario. 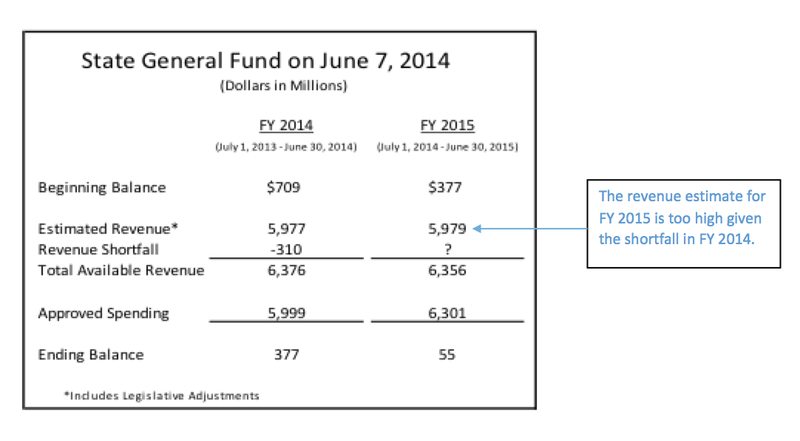 Given what we now know about revenue collections in FY 2014, the FY 2015 revenue estimate is almost certainly too high. If revenue does not come in as estimated, spending must be cut to keep the bank balance above zero. FY 2016 (July 1, 2015 to June 30, 2016). Next January lawmakers will face setting a budget for FY 2016 at a time when the state is already set to spend over $300 million more than it takes in. Spending pressures will only be upward from there. Revenue will be flat or low growth. The bank account will be empty. 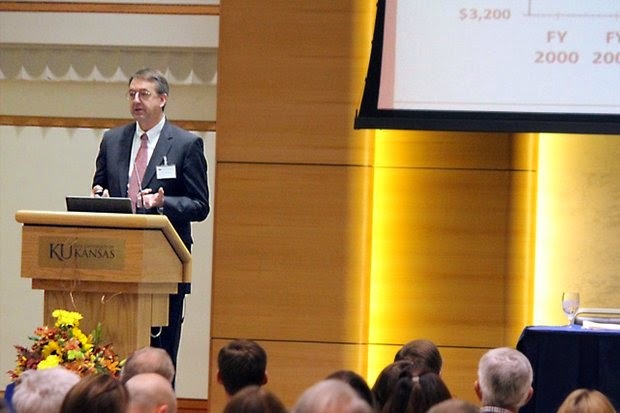 Spending pressures will be upward because of Kansas' Medicaid obligation and its Kansas Public EmploymentRetirement System (KPERS) obligation — both of which the state cannot avoid, because perpupil aid to public schools has been cut and needs to move back up, and because the state’s population and demand for quality services is growing. Revenue will be flat or low growth because more income tax rate reductions are set to kick in. The top rate has already dropped substantially, but in calendar year 2015 it will drop further from 4.8 percent to 4.6 percent. The resulting revenue reduction hits full force in FY 2016. The bottom rate drops from 3.0 percent to 2.7 percent in calendar year 2016, affecting revenue in the last half of FY 2016. Somehow, spending and revenue will have to be equalized in FY 2016 just to keep the bank balance above zero. However, financial prudence and state law call for the bank balance to be at 7.5 percent of expenditures, which is about $500 million, not zero. 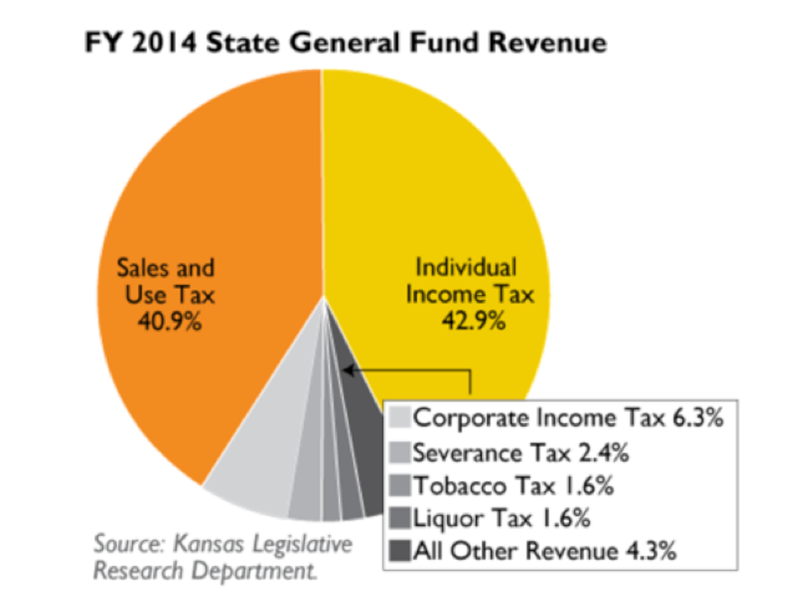 The fallout from the tax policy sometimes termed the “Kansas experiment” is now hitting the Kansas budget hard and fast. The state’s bond rating has been downgraded. Short-term borrowing to pay bills is way up. The state’s financial problems will become steadily more apparent. 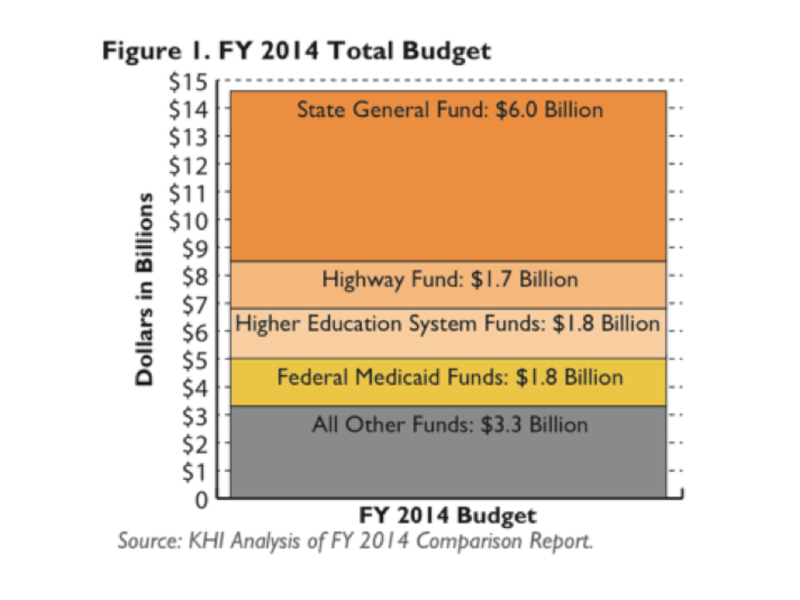 Without a change of course, Kansas faces years of difficult budgets. → Have a question for Duane? Email: duanegoossen@gmail.com. 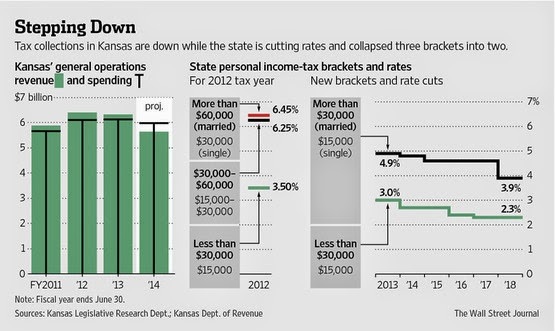 WSJ: "Sam Brownback's Tax-Cut Push Puts Kansas Out on Its Own"
"Two years ago, Kansas Gov. Sam Brownback laid out an aggressive program of tax cuts to turn this slow-growing state into a Texas-like economic powerhouse—and serve as a model for Republican leaders in other states. So far, the results are serving as more of a warning than a beacon. Employment growth is below the national average, while Kansas faces plunging revenue, dwindling reserves and a rare debt downgrade. The Republican governor says his policies need time to trickle through the economy and that other states should use his example to show how lower income taxes can spur private-sector expansion. But neighboring states that once thought of keeping pace with Mr. Brownback aren't mimicking the cuts—and are enjoying about the same job growth. Those that have cut taxes have done so more slowly and often with an eye on keeping tax revenue from slipping. All of that has left Kansas, and Mr. Brownback, as the leading national experiment in using state-level tax cuts to stimulate economic growth. "Sometimes ideological experiments bring unintended outcomes," said Oklahoma Treasurer Ken Miller, a Republican. "I think Kansas is seeing that, and it serves as a reminder for the rest of us." 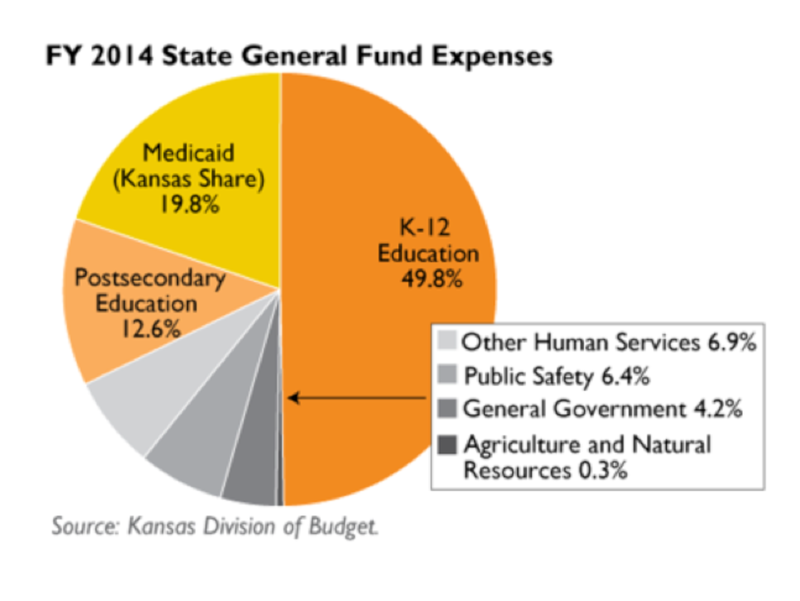 The Kansas budget is made up of several large components. The largest is the State General Fund (SGF), the fund that receives most state tax dollars, and the fund over which lawmakers have the most discretion. The Highway Fund pays for road construction and maintenance with fuel tax revenue, federal highway dollars and fees. Higher Education System Funds come from tuition, fees and federal dollars, and are spent on postsecondary education in addition to money from the SGF. Federal Medicaid funding matches Medicaid spending from the SGF. The All Other Funds portion comprises hundreds of smaller funds, each for a special purpose. In building a budget for the State General Fund, revenues and expenditures must match up or balance. In a given fiscal year it may be possible for spending to be greater than receipts, if a balance has carried over from the prior fiscal year. However, spending cannot exceed the combination of the available balance plus receipts. The state may issue bonds to fund capital projects such as highways or buildings, but the state cannot issue bonds to fund annual operating costs, or to make up an imbalance between receipts and expenditures. In FY 2008, Kansas entered a period of recession, and for three years in a row, receipts to the State General Fund were lower than the year before. 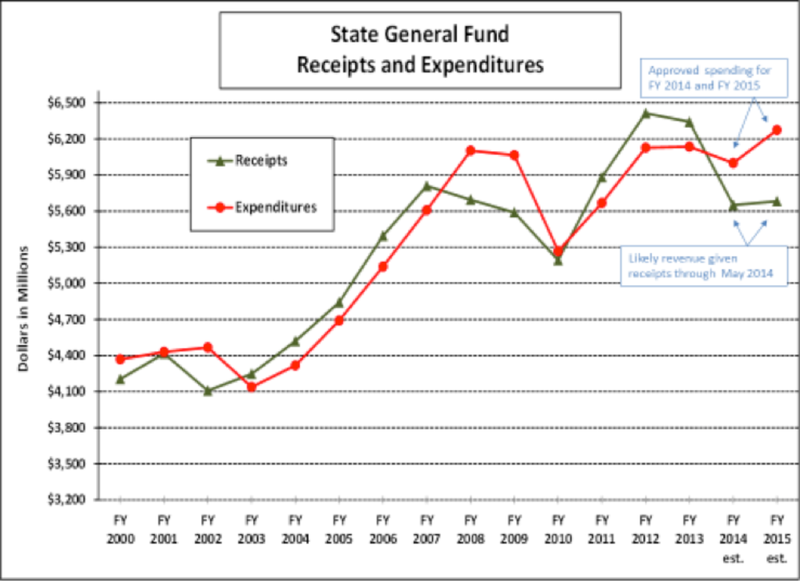 The state entered that period with a large balance in the State General Fund which allowed spending to exceed receipts in FY 2008 and in FY 2009. However, by FY 2010 the balance was depleted, and with receipts continuing to decline, the state was forced to make very significant expenditure cuts. Receipts began increasing again during FY 2011 on the strength of a recovering economy and collections from a temporary one-cent sales tax increase. In FY 2013 receipts again began to decline and then in FY 2014 dropped very sharply as a result of dramatic changes to tax policy. July/August: Agencies develop budget requests for the fiscal year that begins the following July. September 15: Agencies submit requests to budget office. November: Consensus Revenue Estimate determines available revenue. November/December: Budget office works with the Governor, Governor's staff and agencies to develop a budget to be presented to the Legislature. January: Governor's State of the State speech and proposed budget release. February through April: Legislative hearings to debate changes to the Governor's proposed budget. April: Consensus Revenue Estimate updated. May: Final budget approved by Legislature. → Have a question or comment for Duane? Post them below or email to duanegoossen@gmail.com.